"Williams has whittled away every excess from his style. He works with the economy of the Oriental artist. The effect of a landscape is expressed with nothing more than a scattering of irregular spots - a flickering constellation of little shadows and glittering highlights." 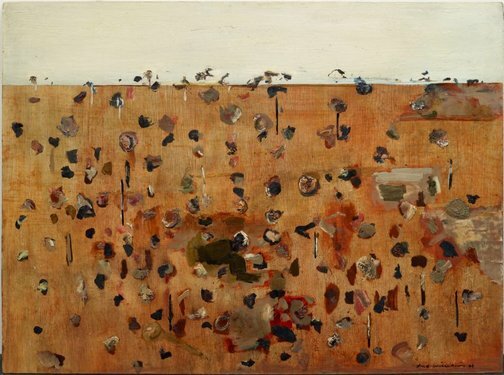 The You Yangs series of 1962-64 marked Williams' breakthrough to the characteristic, spatially ambiguous works regarded by many as the most significant of his career. In works of classical elegance and understatement, he realised his aim of using the landscape as a vehicle for formal invention. From his first visit to this range of granite hills rising from the volcanic plain west of Melbourne, he had been fascinated by the scale of the landscape. 'You Yangs landscape' 1963 is from a brilliant phase of Williams' career, when, spreading his points of focus across the entire landscape, he tilted it so steeply as to remove the sky and create a vertical reading of it. It is a work exemplifying his delight in rigorous geometry and the sheer beauty and capacity of the brushstroke to convey scattered trees and fence-lines. In the following year in which 'Trees on hillside II' was created, Williams' spots become patches and he introduces a high horizon line, heralding the beginning of his Upwey paintings. This work was a finalist in the 1964 Wynne Prize and was acquired by the Gallery in 1965. Signed and dated l.r., "Fred Williams 64". Sasha Grishin, Australian painters of the twentieth century , 'Fred Williams', pg. 184-195, Sydney, 2000, 184 (colour illus.). Bruce James, Art Gallery of New South Wales handbook , 'Australian Collection: Painting and Sculpture', pg. 102-181, Sydney, 1999, 163 (colour illus.). Barry Pearce, Australian art: in the Art Gallery of New South Wales , 'Landscape and gesture', pg. 239-240, Sydney, 2000, 253 (colour illus. ), 302. Art Gallery of New South Wales picturebook , Sydney, 1972, 117 (colour illus.). Art Gallery of New South Wales Quarterly , Sydney, Apr 1966, (illus.). Sunday telegraph , Sydney, 24 Jan 1965. The Sydney Morning Herald , Sydney, 23 Jan 1965. The Australian , Sydney, 23 Jan 1965. Age , Melbourne, 23 Jan 1965. A Short History Of Australia , South Yarra, 1995, colour illus..
10 Masterpieces of Australian Painting , Sydney, 1993, colour illus..